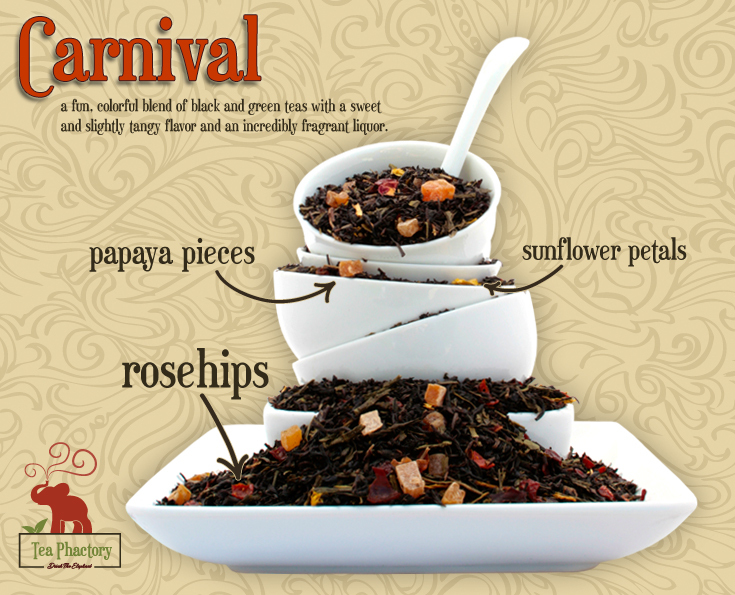 Named after festive summer carnivals and county fairs, Carnival is one of the newest Tea Phactory teas. You will be overwhelmed by the fresh, fruity aroma when you open your container of Carnival tea. This cheerful tea has colorful sweet papaya pieces, beautiful golden sunflower petals and rich red rosehips. You can’t go wrong with this tea. Carnival provides the health benefits of both black and green teas. This blend holds up well and provides Carnival with a full bodied flavor and refreshing aroma. Carnival is a delectable, forgiving tea that will still taste great even if over-steeped. It also makes a flavorful iced tea, with a sweet fruit flavor. Carnival pairs well with salads, chicken dishes and fruity desserts. I particularly like Carnival paired with a cranberry spinach salad.